SBI Clerk Prelims Syllabus must be properly checked before you start the examination. Candidates must master each of the these topics to ensure high score in SBI Clerk Exam. SBI has finally announced the recruitment for the post of Clerical Cadre. The SBI Clerk Prelims exam is scheduled to be held in month June / July but exact date has not yet announced. SBI is going to recruit 8000+ candidates into the clerical cadre with a changed pattern and overhaul post of Junior Associate (Customer Support & Sales). Latest Update : Online registration will start from 12th Apr 2019 and will closed on 3rd May 2019. SBI Clerk Prelims Exam is of 1 hour duration (separately-timed) and has 3 sections as populated below in the table. SBI has introduced the sectional timing in prelims exam this year. It means that you will not be able to switch between the sections. Note : For each wrong answer, 0.25 marks will be deducted. So be careful while giving the answer. As SBI has not released the Syllabus for SBI Clerk Prelims Exam, we can conclude by the questions asked in the previous years that the syllabus is really vast and tough. Due to competition increasing, SBI is now test the candidate’s versatility to solve the complex and tackle the tough situations in life. 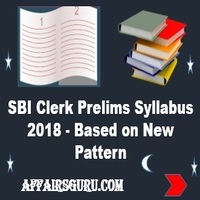 Our AffairsGuru Team is make you acquainted with the SBI Clerk Prelims syllabus 2019. It will include all the expected and important topics that candidate need to prepare for different sections of SBI Clerk Prelims. SBI Clerk Prelim 2019 contains the three sections as given below. We are here providing the subject wise syllabus with mark distribution. ♦ Based on Tense,Subject-Verb Agreement, Article-Noun Agreement, Correct Part of Speech, Sentence Construction, Degree of Comparison,Easily Confused Words, Correct use of Prepositions, Phrasal Verbs. ♦ Could be either grammar or vocabulary based. ♦ Banking and Economy, Business, Social Issues, Moral Stories in Indian Context. Theme and main idea based questions like tone/ style/ title/ theme of the passage. Vocabulary based questions include synonymous, antonyms and meaning of phrases. ♦ Understanding of the context will help you score easily. Sometimes the blank might require a word that will test the knowledge of grammar. ♦ Special emphasis is given on stories and passage can be on any topic. ♦ Words are usually come easy to moderate , so think about the word before selecting option. ♦ The passage is usually a story in the Indian context. ♦ Usually 6 sentence to be arranged. ♦ Grammar based tests knowledge of tenses, prepositions, conjunctions, verbs to mention a few. ♦ Fairly easy as they can be understood from the context of the sentence. ♦ Problems on Average Weight/ Height/ Age/ Marks etc. ♦ Questions on BODMAS Rule, Approximate Rule, Fractions, Decimals, Surds & Indices, Percentages. ♦ Finding the Missing Term. ♦ Line Graphs, Bar Graphs, Pie Charts, Tabular Graphs and other miscellaneous info graphics based questions. ♦ Calculation oriented basic percentage problems. ♦ Simple Interest, Compound Interest and Mixed Problems of SI & CI. ♦ Area of Square, Rectangle, Circle, Semicircle and Parallelogram, Cone, Cylinder based questions are asked. ♦ Successive Selling, Partnerships, Discount & MP based questions. Questions can be also asked on Dishonest Dealing. ♦ Divisibility & Remainder, Multiples & Factors, Integers, LCM & HCF based questions. ♦ Basic Selection and Arrangement Problems. ♦ Problems on making a mixture of two or more entities/mixtures. ♦ Includes Meaning based, Letter based and Meaningful Words based questions. ♦ Less frequently, GK based and number based questions can be asked. Level : Scoring, Easy to Solve, Less Time Consuming, High Accuracy Possible. ♦ Questions on Random Sequence of Alphabets, Number Arrangements, Mixed Series Dictionary or Alphabet based Arrangements etc. ♦ Mostly questions on Coding-Decoding in Fictitious Language and Coding by Analogy. ♦ Possible questions could also include Coding-Decoding by Letter Shifting, and Coding Letters of a Word. ♦ Simple problems that can be solved by just drawing all information on paper. ♦ Ordering & Ranking, Blood Relations, Coding in Fictitious Language, Circular Arrangements, Directions & Distances, Ages & Birth dates based questions. ♦ Questions could be asked on whether the conclusions follow or not. ♦ Problems with 2-3 statements and 2-3 conclusions. ♦ Possibility based questions can also be asked. ♦ Questions on arranging by age, floor, rank, order in row etc. Puzzle questions comes of 10-15 marks from the below Topics in Reasoning. ♦ Problems involving 2-3 rows facing each other. ♦ Includes Uni-Directional and Bi-Directional problems. Tough Square/Rectangular/Triangular problems also possible. ♦ Requires clean charting, proper technique and step-by-step solving. ♦ Problems on teams and committees asked. ♦ Less likely to appear. Very similar to Double Line-up problems. There is a continue upward trend in the complexity of questions. It has made the consistency of the examination pattern a question mark. So candidates practice as much as you can, put the best of your efforts in your preparations, prepare all the topics well and make a go of it. Candidates can check the SBI Clerk Exam analysis which was conducted in previous year. Aspirants can find the salary structure and job profile for clerks by clicking on below link. Check the SBI Clerk 2018 notification.